Photo by Bryan Stevens This rose-breasted grosbeak struck a window Monday, Oct. 3, during fall migration. Although this bird rested and later recovered, many birds are felled by similar perils and obstacles as they migrate south each fall. A stunned rose-breasted grosbeak recuperating on the front porch on Oct. 3 provided a reminder that migrating birds face a variety of perils and obstacles as they wing their way back south. Now that we’re into October, many of the birds of summer — orioles, tanagers, warblers and hummingbirds — are becoming scarce in our yards and gardens. These neotropical migrants are temporary visitors, remaining in North America only long enough to nest and raise young before they take to the wing to return to more tropical regions for the winter months that will grip their summer home in snow and ice for several months. Some of these birds migrate out of the tropics to avoid competition. Others find North America a land of abundant, albeit temporary, resources. This land of plenty offers a wealth of insects, seeds, fruit and other nourishing, nutritious food to help parent birds keep their strength while they work to ensure their young thrive. The phenomenon of migration isn’t exclusive to the neotropical migrants of the New World. Birds in other parts of the world migrate, too. Photo by U.S. Fish & Wildlife Service The tiny ruby-throated hummingbird crosses the Gulf of Mexico twice yearly to migrate from Central America to North America in the spring and back again in the fall. The Arctic tern, for example, truly takes migration to extremes. This small seabird travels each year from its Arctic nesting grounds to the Antarctic region, where it spends the winter months. 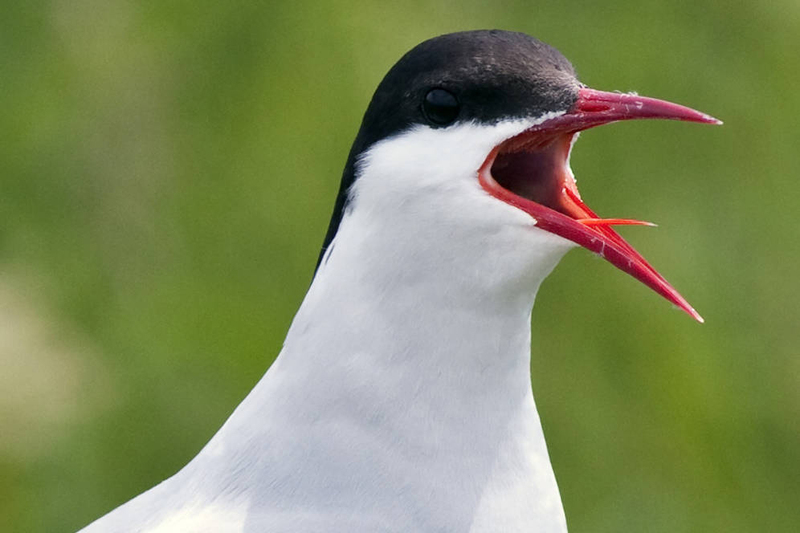 Put into terms of mileage, the Arctic tern can travel about 50,000 miles in a single year. For a bird with a body length of about 15 inches and a wingspan of about 28 inches, this incredible migration is an astonishing feat. 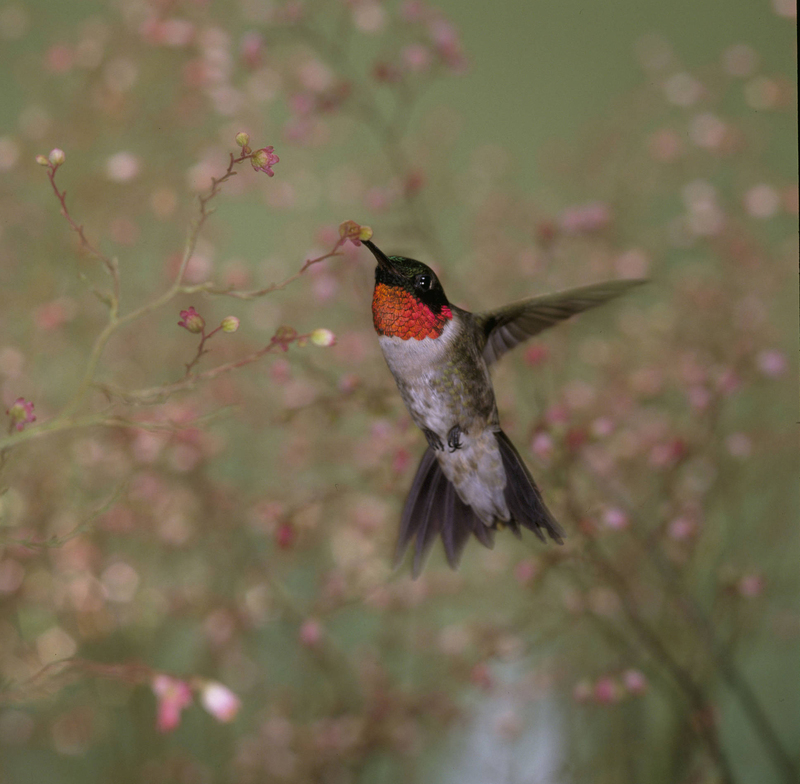 The ruby-throated hummingbird, a favorite of many bird enthusiasts living in the eastern United States, makes an impressive migration each year. Just to reach the United States, these tiny birds undertake a strenuous journey. They leave their wintering grounds in Central America to return to the United States and Canada for the nesting season. Most of these tiny birds, which are barely four inches long, make a non-stop flight of more than 500 miles across the Gulf of Mexico. The journey can take almost an entire day! With the end of summer, the entire population of ruby-throated hummingbirds, increased by a new generation of young birds, makes the Gulf crossing for a second time in a year to return to the American tropics for the winter months. The broad-winged hawk, a raptor found in the region during the summer, makes a fall migration back to South America every fall that astonishes human onlookers who gather along mountain peaks to witness the spectacle. The hawks form large flocks, also called kettles, that can number thousands of birds. Photo by U.S. 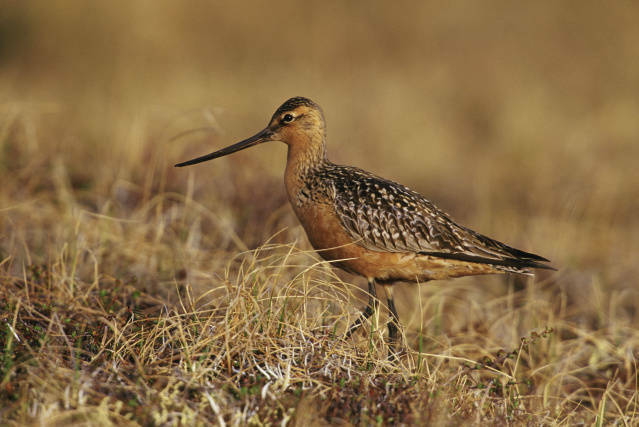 Fish & Wildlife Service/Steve Maslowski The bar-tailed godwit stages migrations that can take nine days of non-stop flight spanning nearly 6,000 miles. Shorebirds, which in North America can consist of birds ranging from plovers and godwits to dowitchers and avocets, are champion migrants. The bar-tailed godwit makes an even more impressive non-stop migratory flight. This shorebird nests in parts of Scandinavia, northern Asia and Alaska. Some of these godwits make a nine-day non-stop migratory flight that takes them from New Zealand to the Yellow Sea of China, a distance of almost 6,000 miles. Needless to say, since the godwits make no stops along the way, they must also go without food for the duration of their journey. Most of the warblers that nest in North America retreat to Central and South America during the winter months. Few warblers, however, make as great a journey as the blackpoll warbler. Instead of migrating over land, this five-inch-long warbler undertakes a two-stage migration. The first half of the migration is a non-stop flight of about 1,500 miles. Every fall, these tiny birds fly over the ocean during this part of their migration, departing from Canada or the northern United States and not stopping until they reach various locations in the Caribbean. There they will spend some time recovering from the exhausting first half of their journey before they continue their way to such South American countries as Colombia and Venezuela. Once again, during the time they spend flying over open ocean, these tiny warblers do not feed. Even birds that cannot fly undertake migrations. For instance, flightless penguins swim hundreds or thousands of miles to reach preferred ranges for feeding or nesting. The Australian emu, a smaller relative of the ostrich, makes seasonal migrations on foot to ensure access to abundant food supplies at all seasons. Photo by U.S. Fish & Wildlife Service/Kirk Rogers The Arctic tern’s migration, which takes it from the Arctic to the Antarctic, keeps this small seabird in the sky for about 50,000 miles each year. Birds are not even the only animals to migrate. Many creatures, from whales and wildebeest to dragonflies and butterflies, impress humans with their endurance as they stage regular migrations. Even as some of our summer favorites depart, we should prepare to welcome back some winter favorites, including dark-eyed juncos, yellow-rumped warblers, white-throated sparrows and yellow-bellied sapsuckers. Fall is indeed a time of departure for many birds, but it’s also a time to make new friends with the other birds that should soon start arriving in our yards and gardens. 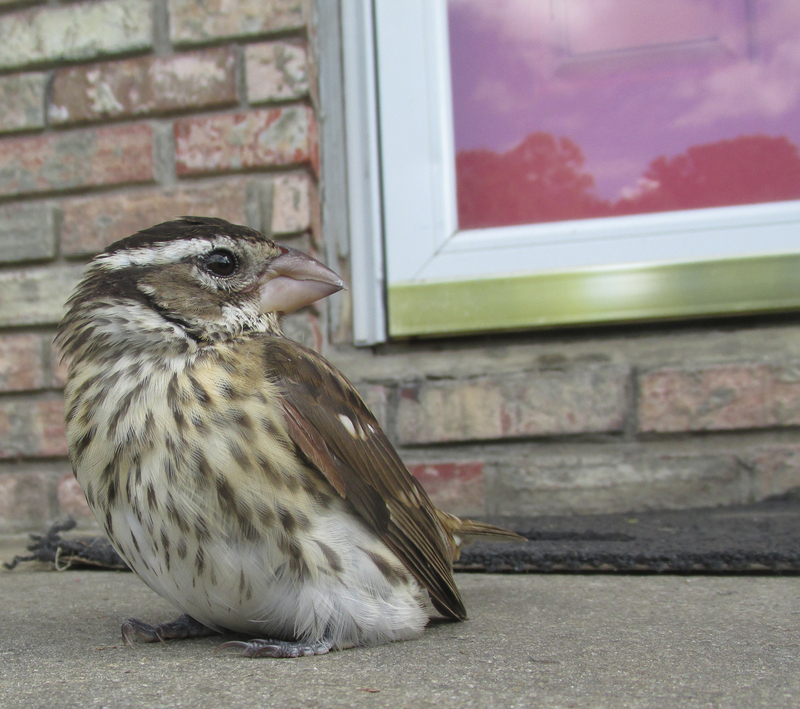 As for the rose-breasted grosbeak on the porch, that story had a happy ending. After taking some time to recover after apparently striking a window, the bird hopped around the porch for a moment and then took wing and flew to nearby hawthorn trees. The bird’s flight — strong and straight — delighted me. The grosbeak could have been badly injured or even killed. I wished it the best for the remainder of its journey. I’m dedicating this week’s column to the memory of J. Wallace Coffey, a great birder and wonderful individual who died Tuesday, Sept. 27. I met Wallace, a native of Bristol, Tennessee, back in the late 1990s. He introduced me to some wonderful birding destinations in the region, including such Virginia locations as Burke’s Garden, Steele Creek Park in Bristol, the wetlands of Saltville and Musick’s Campground on Holston Lake. Wallace was a tireless promoter of birds, birding and birders, and he loved to encourage young people to explore nature. He was also a great leader for the Bristol Bird Club, as well as the Elizabethton Bird Club. He will be greatly missed. Bryan Stevens lives near Roan Mountain, Tennessee. To learn more about birds and other topics from the natural world, friend Stevens on Facebook at https://www.facebook.com/ahoodedwarbler. He is always posting about local birds, wildlife, flowers, insects and much more. If you have a question, wish to make a comment or share a sighting, email ahoodedwarbler@aol.com. This entry was posted in Birding, Birds, Elizabethton Star, Erwin Record, Fall Bird Count, Fall migration, Grosbeaks, Hummingbirds, North Carolina, Our Fine Feathered Friends, Roan Mountain Fall Naturalists Rally, Rose-breasted Grosbeak, Shorebirds, Uncategorized and tagged Birding, birds, Birdwatching, Bristol Herald Courier, Bryan Stevens, Carter County Compass, Elizabethton Star, Erwin Record, Fall migrants, Fall migration, Feathered Friends, Hummingbirds, McDowell News, Northeast Tennessee, Our Fine Feathered Friends, Rose-breasted Grosbeak, Ruby-throated Hummingbird, Wallace Coffey on October 16, 2016 by Bryan Stevens.